Casper Vs Eve, which is better? In our opinion, Casper is the better deal, and more value for money. You can get £93 off at Amazon right now. Both the Eve and the Casper mattresses are delivered compressed and boxed. I’m a big fan of compressed mattresses, it’s just so much easier to move them into the bedroom than a flat mattress. I imagine this would be a major deciding factor if you lived at the top of a tall building, or were planning on moving your mattress up several flights of stairs. However, as both these mattresses come boxed, they are both relatively equally matched so far. Again, the results are pretty similar for both the Eve and the Casper. They were both easy to remove from their packaging, and then all you have to do is leave them to gain shape. Both mattresses looked to be at full size in about an hour. Both mattresses had that chemical smell that is common with memory foam mattresses. The smell was a little stronger with the Eve mattress. It did go away eventually with both mattresses, but the smell of the Eve lingered longer. While you don’t spend a great deal of time actually admiring your mattress cover, it’s important that it’s washable and easy to remove. Both mattresses have stretchy covers that can be removed for washing. 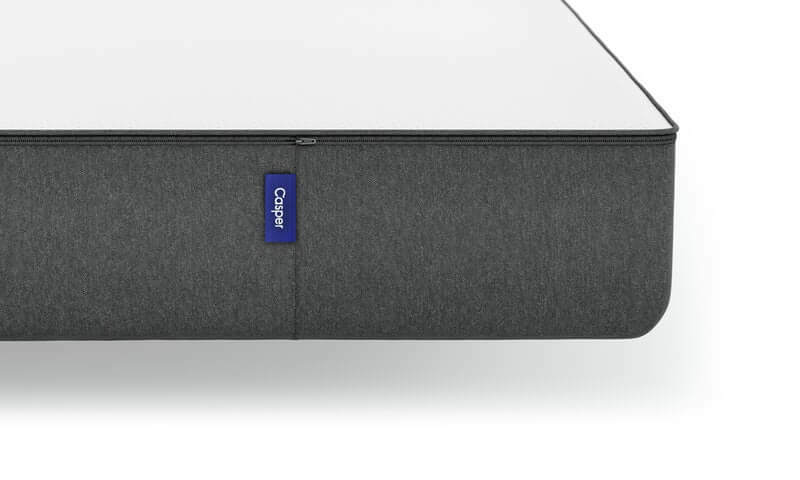 The Casper mattress also has an extra inner cover that stretches over the top and sides of the mattress. This could be useful for preventing staining to the mattress itself, as it’s an extra layer of protection. 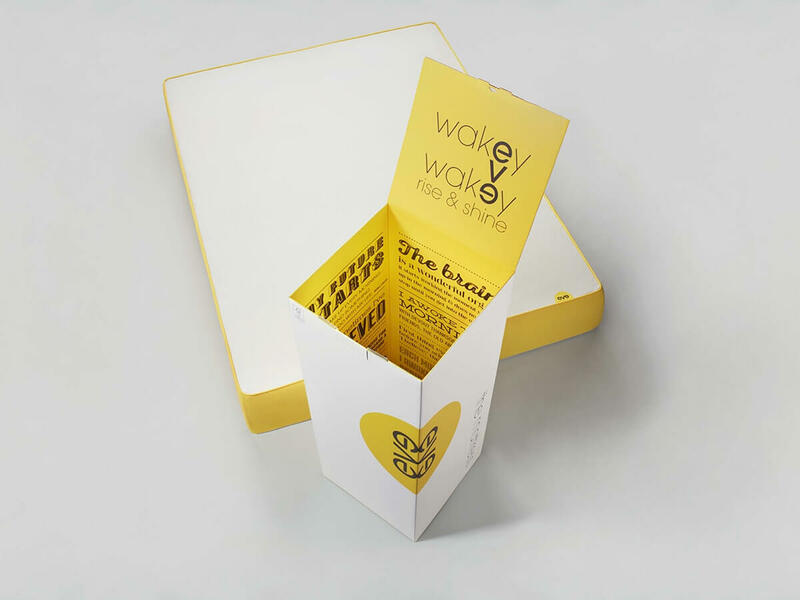 Looks wise, the Eve mattress stands out with its vibrant yellow edges. But, even if you hate the colour, it’s hardly important as it will be covered by your bed sheets anyway. Quality wise, both mattress covers look to be well made, and thin enough to allow air to flow freely in and out of the mattresses. Under the cover of the Casper mattress you’ll find three layers. There’s a base layer made of seven inches of dense foam. On top of this is an inch and a half of high density memory foam, and then the final top layer is an inch and a half of latex foam. This top layer has holes all through it, which is to help keep you cool and allow for air flow from the lower layers. There are also three layers in the Eve mattress. Like the Casper mattress there is a layer of high density base foam. On the Eve, this is seven inches thick. But, this is where the similarities with the Casper mattress end. On top of the base layer, the Eve has 1.2 inches of responsive foam that is highly breathable. This is topped by a layer 1.6 inches thick that is made from new generation memory foam. This innovative take on memory foam combines the properties of both memory foam and latex foam to give you the best of both worlds. We found both mattresses to be medium firm, with the Eve being just slightly softer than the Casper. However, we found that you sink into the Casper mattress a little more. This could be a plus point, if you like to feel secure and cosy in your bed, or it might be a negative if you don’t like this feeling, or struggle to get up and out of your bed. The Eve mattress was very supportive, the Casper mattress was still supportive, but a little less so than the Eve. I’d say that both mattresses would be fine for all sleeping positions, but the Eve comes out top for motion. If your partner tosses and turns during the night, this would be a good choice as you can hardly feel it. However, this is at the loss of bounce, so if you like a springy bouncy mattress, the Casper may be the better choice. We found that both mattresses had good cooling properties. Memory foam mattresses are notorious for making you feel too hot, so both have the balance right with these mattresses. 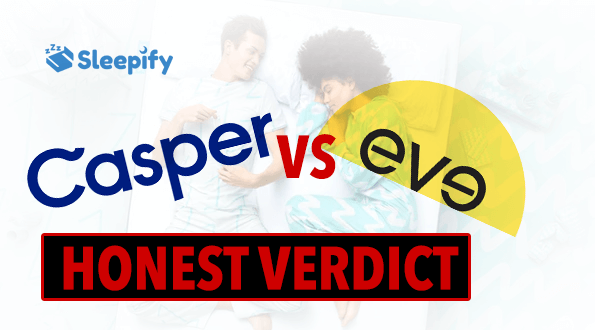 Of course we all have different requirements when it comes to mattresses, but with both the Casper and Eve, you get 100 nights to trial your mattress, and you can return it for a refund if you find it doesn’t suit you. There’s nothing fundamentally wrong with either mattress. Both are good quality mattresses with a lot to offer. It’s all in the detail. In our opinion, the Eve mattress would be the better of the two for heavier people. The Casper mattress is a little bouncier, so this could play a part in your decision. There’s a decent 10 year guarantee on both products, and of course there’s a 100 night trial, so you don’t have to worry that you’ve made the wrong decision. How to Sleep 100% Better Tonight!